DO you recognize this image? Honestly, if you’ve been in Oxford at all in the last couple of months, the chances are that you’ve already made awkward eye contact with this particular damned soul. Clutching himself in horror, surrounded by flames, he stares out from every lamppost, JCR pidge room, and flanks the steps of the Ashmolean museum. ‘Los howl’d’, a colour relief etching from ‘The First Book of Urizen’ (1796) is the face of ‘William Blake: Apprentice and Master’, the museum’s latest major exhibition. The exhibition follows Blake from his beginnings as apprentice to the engraver James Basire, to an exposition of his full mastery. We are first given a sense of Blake in his context, offering us an introduction to Basire’s work and that of his contemporaries. Examples such as ‘The Field of the Cloth of Gold’ (Basire, 1772), are remarkably detailed and helpfully ground us in the techniques and methods of eighteenth century copperplate engraving. Less successful is the reconstruction of Blake’s printing studio, which comes across as thin and cursory in the context of this otherwise rich and vibrant exhibition. If Blake’s work earlier felt somewhat sidelined by the emphasis on the work of Basire and his contemporaries, in the later rooms he takes centre stage. We learn of Blake’s innovative contributions to engraving and printing, such as relief etching. The inclusion of the mid-thirteenth century Bible Moralisée shows the inspiration behind Blake’s progression towards integrating text and image, culminating in the illuminated manuscript for which he is most famous. Whilst Blake is innovative, he is nonetheless consistent. At every point in his oeuvre, emphasis is on the human form. The early yet striking ‘Head of a Damned Soul’ (1789), depicts a vast, looming face, which swells to fit the frame. Later, we encounter the body in its totality, especially in the illuminated manuscript Europe a Prophecy (1794). Here, fleshy, Titan-esque beings abound in the page margins of this mythological narrative. The exhibition culminates in a display of Blake’s ‘visionary landscapes’. Building upon the human forms he perfected in his earlier work, Blake situates his souls within vast and boldly imagined locales. It is in examples such as ‘The Whirlwind of Lovers’ (1827), a visual interpretation of Canto V of the Divine Comedy, in which Blake most fully enacts his concept of the ‘divine imagination’. Whether you’re a student of eighteenth century literature, an art enthusiast, or searching for an insight into the mind of a visionary artist – the William Blake exhibition is not to be missed. 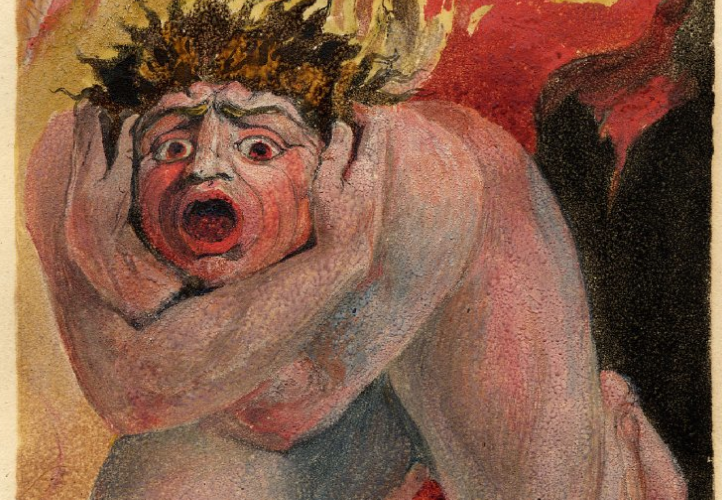 ‘William Blake: Apprentice and Master’ runs until 1st March 2015.